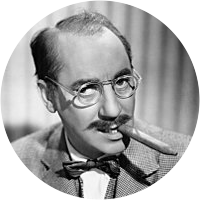 A collection of the best Groucho Marx quotations. I don't want to belong to any club that will accept me as a member. If there was no action around, he would play solitaire—and bet against himself. Please accept my resignation. I don't care to belong to any club that will have me as a member.